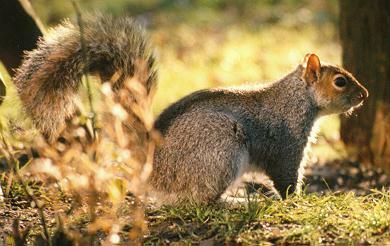 Of all the species of wild mammals that are native to Leeds, none are more frequently encountered than squirrels. Squirrels belong to the most successful and widespread order in the world, rodents. One of the main differences between squirrels and most other rodents is that squirrels have a rather large, bushy tail. All rodents are gnawing animals. Squirrels have well-developed jaw muscles and chisel-like front teeth that can chew through just about anything. These front teeth are kept sharp by gnawing on hard objects such as woody plant materials, seeds and nuts. This gnawing also serves another purpose. A rodent's front teeth grow constantly, so they must be filed down or they will grow to the point where they inhibit eating and the animal will starve. Rodents are known for their high reproductive rate. Here in Leeds, squirrels usually produce 2 litters of 2-4 young each year. The first litter is born in January or February while the second arrives in mid-summer. Young squirrels mature rather slowly for a rodent and are on their own in about 2 1/2 months. Leeds' squirrels give birth in nests normally located in trees. This nest also is the centre of the adult's activities throughout the year. Most squirrels are active during the daytime. This characteristic makes their activities quite noticeable to us. They rely on their keen senses to detect danger when it is still some distance away and then they make a quick escape. Squirrels basically are vegetarians. They eat a wide variety of plants, but they mostly use fruits and nuts. In the autumn, they are especially attracted to oaks, hazel and beech. Medium-sized squirrels weigh about 1 pound and are about 15 inches long, half of that being their tail. As their name suggests, their most common color is grey with rust- colored hairs scattered throughout their coat. 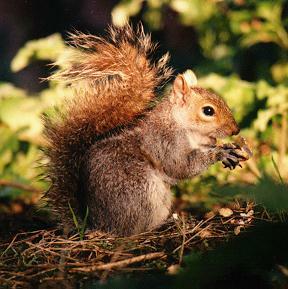 Under natural conditions, grey squirrels are most abundant in hardwood or mixed hardwood and pine forests. They are common in urban areas though, because they are not very fussy about their habitat needs. They do quite well in residential areas where only a few large trees are present. Oaks are especially attractive to them and they can supplement this food by using bird feeders and gardens. Squirrels make interesting wildlife neighbours and can often be attracted to your landscape with minimal effort. Attracting squirrels by feeding them, however, is not recommended. If you start feeding a squirrel each day, word soon gets around the squirrel world that there is a new food source and within a week or two you have six or more squirrels coming to your house to be fed. Squirrels can eat a lot of nuts and it soons gets very expensive to feed them all. Also they tend to bury a few nuts for future use. Usually this is in the middle of your lawn or even worse your neighbour's lawn. This isn't too much of a problem as they are very tidy when burying the nuts, the problem comes when you go away for a few days. The squirrels are not now getting their daily ration of nuts from you, therefore they turn to their buried stores. When they dig up a nut they do not mind leaving a mess. You come back from your break and find your lawn looking like a ploughed field. If despite these warnings you still cannot resist feeding your local squirrels then you need to know what to feed them. They like nuts of all types. These should be raw, preferably in their shells. Do not try to feed them salted or roast nuts. Hazelnuts in shells are particularly favoured, followed by raw peanuts in shells. They also like shelled brazil nuts, sweet chestnuts and acorns. They also appreciate it if you put out a shallow bowl of fresh water for them every day. It is not a very good idea to put out shelled peanuts or other small nuts as these either attract large numbers of pigeons, which also like them, or if they are picked up by smaller birds they can choke on them. Squirrels are best encouraged by giving them food and cover within your landscape. All squirrels can be encouraged by planting oaks, hazel and beech. Nest boxes can also be constructed when large mature trees are limited. Grey squirrels will use a properly designed wood duck sized nest box. When squirrels cause problems, the methods used to solve them must be specific to the problem at hand. Squirrels can cause a wide variety of problems. Therefore, there is no one squirrel-control method that is appropriate for every problem that might arise. Control measures also should include the elimination of the cause that allowed the problem to occur if at all possible. One major cause of Leeds squirrel problems is feeding, either directly or through a bird feeder. Should this food be reduced or eliminated (you move, go on vacation, quit, etc.) the squirrels often respond by chewing up nearby vegetation. Another major problem associated with an artificially fed squirrel population arises from the usual lack of good nest trees for them to live in. Many squirrels that take up residence in an attic or garage ceiling can be traced to a feeding situation. If your problem has arisen because of this, slowly reduce your feeding program until you stop it completely. If you have problems with squirrels attacking and demolishing your bird feeders, then there are a number of solutions. Firstly you can buy a squirrel proof or squirrel resistant bird feeder. These can be expensive, but they do work. Secondly you can buy a bird proof squirrel feeder. This consists of a box which looks like a bird box but has a perspex front and a hinged lid. You fill the box with nuts and the squirrels see the nuts and soon learn to lift the lid and take the nuts out. By giving the squirrels their own supply of food they then stop attacking the bird feeders. Both squirrel proof bird feeders and bird proof squirrel feeders can be purchased from CJ Wildbird Foods. To see the video clips you will need to have Real Player installed on your computer. You might already have it installed as it sometimes comes as a standard plug-in with an Internet browser. It is definitely on the latest Freeserve CD. If you have not got Real Player on your computer yet then you can download your free copy from the Real Web Site. It is quite a big download (6Mb in size, it takes about twenty minutes to download with a 56K modem) but you only have to do it once. If you want the free version of Real Player then don't get confused by following the links to the similarly sounding version for which there is a charge! The free version is Real Player, the version for which there is a charge is Real Player Plus. The Real Player has also appeared on a few computing magazine cover CDs so it is worth checking these as well. Back to The Squirrel Home Page.